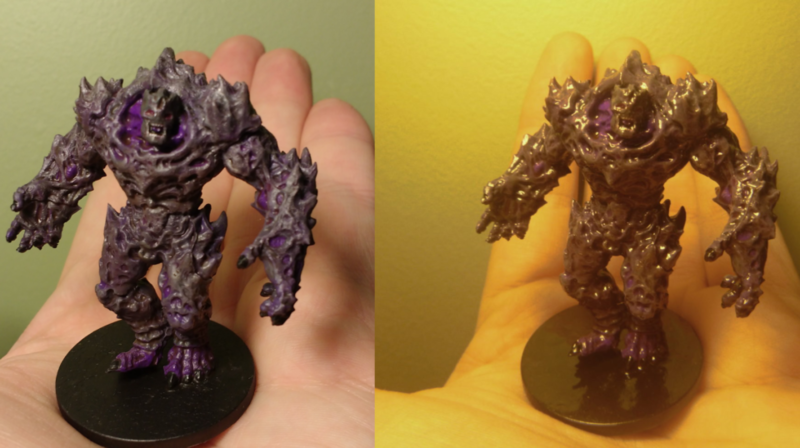 I’ve been nervous about applying a spray on matte finish onto my painted and very glossy miniatures. There are plenty of pros – the detailing stands out more, it doubles up on the durability of the paintjob, and the miniatures don’t look like they’re covered in slime. But after my bad experience with spray on primer I was put off on the whole spraying process. It doesn’t help that it’s winter and I don’t have a good space for spraying miniatures with finish. But after some helpful advice from the bloggers at Dagger & Brush and Stroke of Meh I decided to rally my courage. I think that the results, at least for my Plague 1st Gen Dark Force, speak for themselves. Now let me share the advice that I was given. Frosting is indeed the dread of any modeller. However, given you used a polyurethane varnish the surface should be nice and smooth, not porous. I understand the frosting comes from the matting agent settling on the surface, while the liquid penetrates the porous surface. Accordingly I would assume that a smooth surface is less likely to frost up. You can also use some left over sprue painted black to test your spray varnish on. If it frosts wait for better spraying conditions. Avoid high humidity or extreme dry conditions. Warm the can up before you use it and shake very well. If you do this you should be fine. If it does frost I think you can use a bit of rubbing alcohol to remove the matte varnish again. The polyurethane should still protect your piece and will not be affected. Believe it or not, the humidity and cold in the air was the biggest culprit in my first attempts. Nowadays, I wait for sunny, warm days before applying any sort of spray to my miniatures. Hope this helps!!! I think the matte finish is an excellent idea. You can either get some inexpensive spray-on matte varnish or buy varnish that you can apply by brush, and just give your minis a thin layer to take off the shine (since they are already protected by the MinWax). If you go with the latter option, I strongly recommend Vallejo’s Matte varnish. Yep, same exact rules. 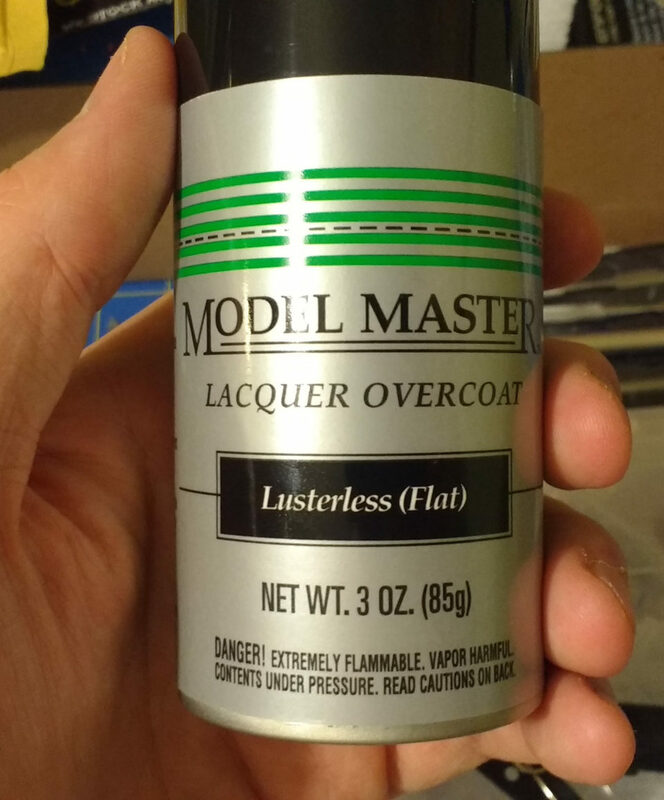 You should only need a very thin coat to dull out the shine, so frosting should not be as much of a problem as you had with primer, where you needed to cover the whole miniature. If you find out that you got frosting anyways and you get some foggy spots in your miniature, wait for it to dry and then use a brush to gently dab some Gloss Varnish or MinWax on the area, wait for it to dry and repeat as much as needed. It won’t fix it 100%, but it will disguise the fogginess. It was good advice. I’d ordered a can of matte finish before Christmas and when it arrived I set up a secure little corner of the garage for spraying. This brand worked well enough. It was inexpensive, didn’t frost, and applied evenly. My only complaints are that it needed several coats to really dull down the gloss (maybe that’s the polyurethane’s fault) and that the can rapidly emptied. It took three coats of matte for the Plague 1st Gen to reach the state in the comparison photo. Next time I think I’ll try the Vallejo brand that Stroke of Meh recommended but I was by no means unhappy with this one…just hope that I’d be happier with another. 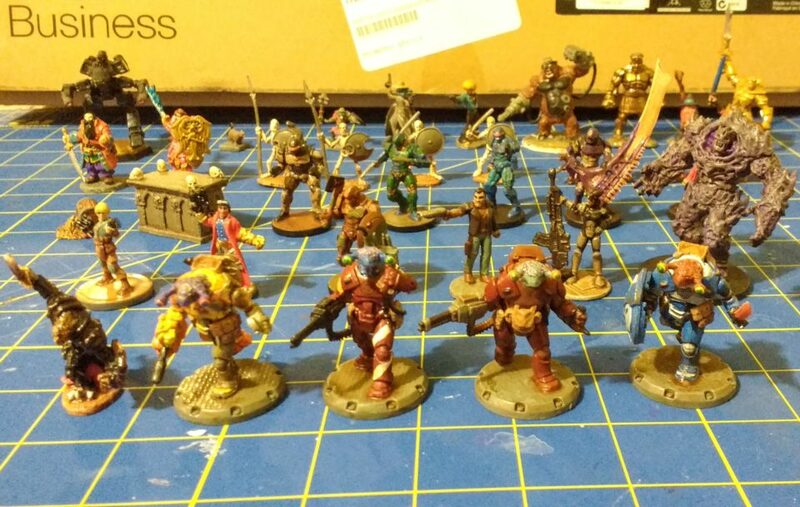 Here’s an updated photo of all miniatures that I’ve painted to date. I applied the matte finish to all of them except for the Battleguard and Stone Golems. Hopefully you can tell that there’s a decrease in gloss…though I think that some of them would benefit from additional coverage. That really brought out the details on the abomination. You can, as mentioned, always use brush on if the weather is not perfect for spray varnishing.